The Eagle lies on her starboard side in 110 feet of water three miles northeast of Alligator Reef Light. On October 6, 1985, she caught fire. Two U.S. Coast Guard cutters responded to her distress call, but the ship's superstructure was destroyed. After being declared a total loss, the Florida Keys Artificial Reef Association purchased her for $30,000 and Joe Teitelbaum, a private citizen, donated another $20,000 to help create an artificial reef. 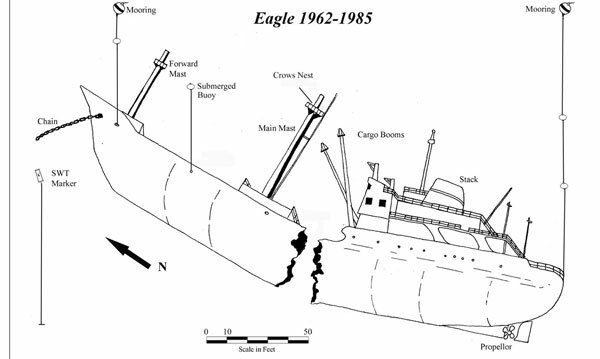 The ship was then named the Eagle Tire Company, and was cleaned, gutted of all wooden parts, and all oil and fuel was removed to protect the marine life in the area. The Eagle has a number of interesting structural features that make it a notable dive attraction. A large anchor chain exits the hawse pipe on the port bow, and continues a considerable distance before disappearing in the sand. Two large mast assemblies rest on the bottom. One is set on the forecastle; the other, amidships between cargo bays. Each has its own ladder and observation platform in place. Toward the stern there is a tandem set of cargo booms. Heat damage from the fire can be observed in the stern quarter. The deck railings at 70 feet, and her propeller and rudder at 110 feet, are still intact. 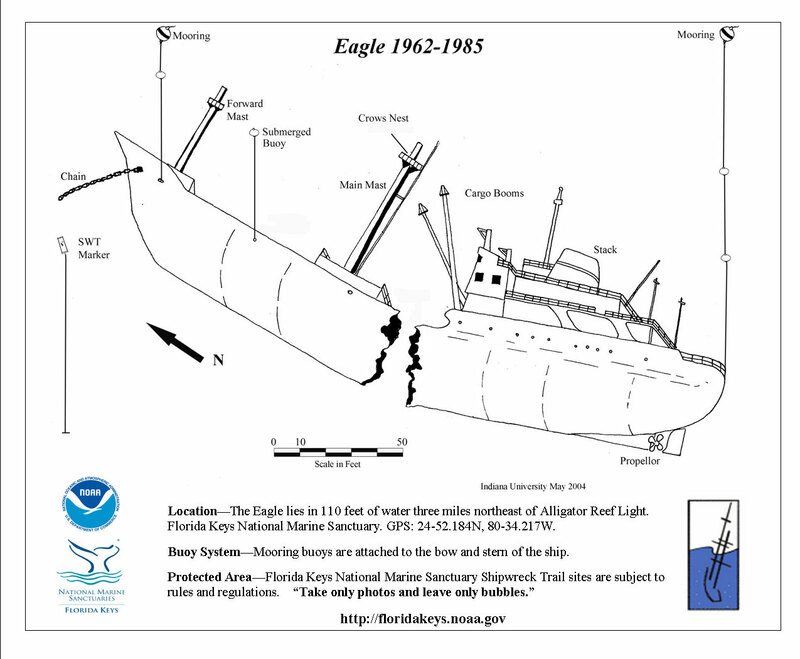 In 1998, the Eagle was broken in two by Hurricane Georges. Click here for a printable version of the Eagle site map. View a map showing the locations of buoys at the Eagle shipwreck site.